Widespread tree mortality in Sierra Nevada forests was an important mechanism regulating water levels during California's recent drought. Photo courtesy of Margot Wholey. Researchers used measurements from the Southern Sierra Critical Zone Observatory (CZO) in California’s Kings River Basin to pinpoint four distinct mechanisms responsible for regulating runoff levels during the recent drought. Runoff — water from precipitation, snowmelt and natural reservoirs that feeds into mountain streams and rivers — ultimately supplies much of the state’s water. Two mechanisms — evapotranspiration and warming — decreased runoff levels and intensified the overall effects of the drought. “Runoff in mountain rivers ultimately reflects the difference between precipitation, which occurs as both rain and snow, and water returned to the atmosphere through evapotranspiration, which is mainly water used by plants plus evaporation from soil,” said Roger Bales, SNRI director and lead author of the new study. The drought was dominated by evapotranspiration, which varied little from year to year in Sierra Nevada forests, even as precipitation levels declined. As a result, more water was returned to the atmosphere than drained into nearby streams and rivers. This alone led to a 30 percent reduction in springtime runoff. The warming climate only made matters worse. Temperatures were a full degree Celsius higher than they were the decade prior. This warming resulted in drier, hotter atmospheric conditions favorable to further evapotranspiration. Elevated temperatures ultimately led to an additional 5 percent reduction in runoff. 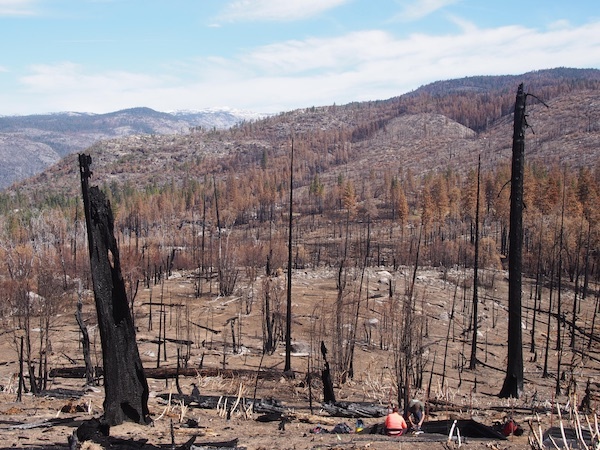 Wildfire and tree mortality helped mitigate the harmful effects of the drought. Photo courtesy of Emma McCorkle. But the news wasn’t all bad for runoff levels. Scientists also described two processes that actually helped mitigate the drought’s harmful effects. Local differences in precipitation and evapotranspiration resulted in 10 percent more runoff than might otherwise be expected. Even with rising temperatures, winter evapotranspiration remained low at colder, higher elevations. This meant that upslope meltwater, primarily from high-elevation snowpack, acted as a buffer against downslope declines in runoff. And scientists identified another mechanism that helped reduce the drought’s overall impact. It was this fourth master regulator that proved most interesting to researchers. Drought years were characterized by widespread tree mortality — the result of increased wildfire and drought-associated tree dieback. This had the effect of thinning forests, but also reduced forest-associated evapotranspiration, leading to a 15 percent increase in 2016 spring runoff. 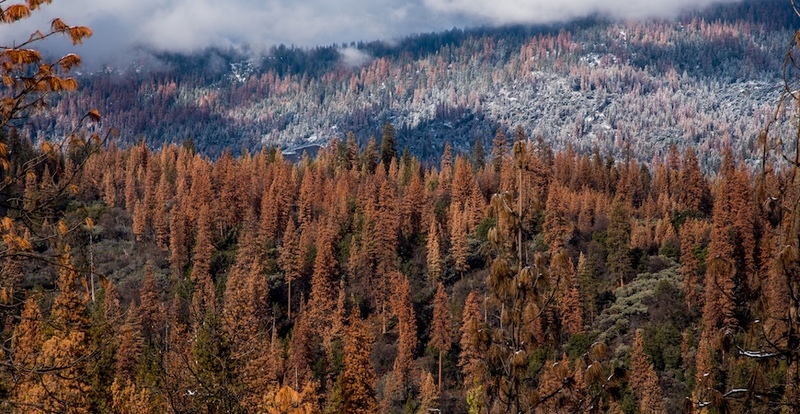 “This fourth mechanism is potentially the most important in the southern Sierra Nevada, depending on how long the reduced evapotranspiration is sustained,” Bales said. But Bales warns that tree mortality isn’t a sustainable long-term solution to drought. Still, the findings demonstrate that the environment is able to maintain a balance in the face of severe drought, at least in the short term.